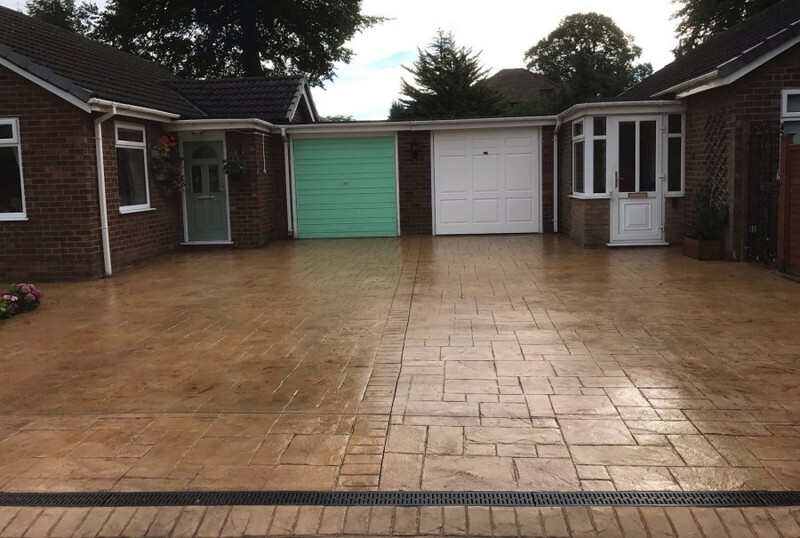 Lasting impressions recently undertook a job in Brooklands for a double driveway to the front of two bungalows who have adjoining garages. A patio area was also re-surfaced at the back of one of the bungalows. At Lasting Impressions, we offer a range of styles, colours and finishes. With so many options to choose from it could be impossible to decide. You may already know what you want, however you may be unsure in which case we can provide you with advice on what might be suitable. In this case the two neighbours agreed on sandstone russet for the colour which complimented the existing garages and brickwork, and it was printed in grand ashlar. With the great British weather being so unpredictable and having had so much rain in the last few months in what should be summer, getting the driveways sealed can be a challenge which was evident with this recent job. However, drawing on our skills and expertise we were able to complete the job and as can see the great results from the pictures.